I hope you find great inspiration from all the projects in this hop. You may be starting the hop here at my blog (Jessie Holton) or you may have come from the previous person on the list. Be sure to click on the next person in the list to continue your blog hop adventure casing Bibi's work. 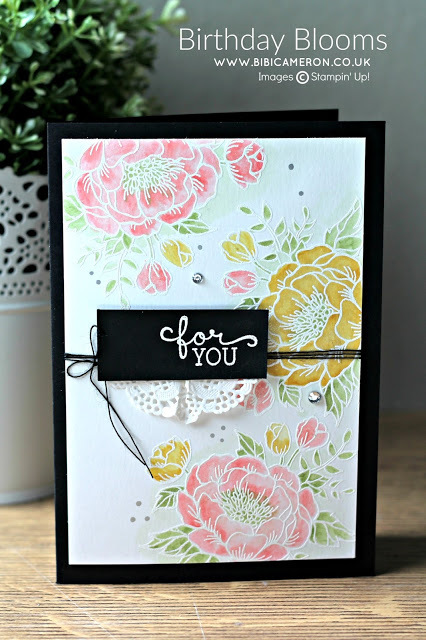 It was really, really hard to just pic one card to case from Bibi, but I ended choosing this one as I love this sort of watercoloured, white heat embossing look before & I think Bibi's card is absolutely stunning, especially with the soft colours on the black background! I have copied Bibi's rose layout & Basic Black cardstock base. I have White Heat Embossed the Birthday Blooms roses onto Shimmery White cardstock & added a Whisper White cardstock layer between the two, with Dimensionals so that the Black Metallic Thread had room to go around the back of the cardstock. I've got about 6 strands of thread to make the bow nice & thick. I have watercoloured the top layer with the following inks: Blushing Bride, Flirty Flamingo, Watermelon Wonder, Sweet Sugarplum, So Saffron, Mint Macaron, Island Indigo & Sahara Sand. I have also stamped the little dots in Sahara Sand & added the little Blushing Bride Enamel Shapes. The banner is also White Heat Embossed on Mint Macaron & Sweet Sugarplum. I have added a layer of Whisper White cardstock on the inside & stamped the rose in stamped off Sahara Sand, then watercoloured it with Blushing Bride, Mint Macaron & So Saffron just lightly so the cardstock didn't peel. Then I used my Aqua Painter to flick So Saffron across the inside of the card. I hope you have enjoyed my card! Please hop around the rest of the Crazy Crafters & check out our cases of Bibi's wonderful work! Remember to use my October Hostess Code AMCFCNZT at the bottom of your Shopping Cart & get a FREE GIFT from me at the end of the month! Please note, you must reside in Australia to order from me.